Chelsea vs Slavia Prague, UEFA Europa League Live Streaming Online: How to Get Football Match Live Telecast on TV & Free Score Updates in Indian Time? Napoli vs Arsenal, UEFA Europa League Live Streaming Online: How to Get Football Match Live Telecast on TV & Free Score Updates in Indian Time? Ram Charan to Lend his Voice for Salman Khan in Bharat's Telugu Version? Kareena Kapoor Khan or Priyanka Chopra Jonas - Whose Yellow Outfit Will You Prefer on a Summer Afternoon? Cherry Blossoms in Japan Turns it Into a Pretty Magical Place Straight Out of a Fairytale! 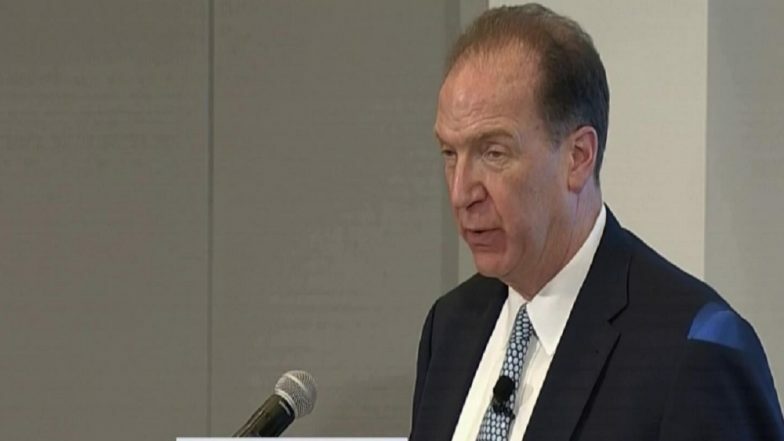 Washington, April 10: David Malpass on Tuesday took office as the president of the World Bank Group, and said he looks forward to undertaking the task with enthusiasm. Malpass made his debut as the 13th president of the World Bank at its headquarters in Washington on Tuesday morning. "I want to thank the Board of Directors and the Governors for selecting me," he told reporters, reports Xinhua news agency. Malpass, former undersecretary for international affairs at the US Treasury Department, was chosen by President Donald Trump in early February as the US candidate for the post, following the abrupt resignation of former World Bank chief Jim Yong Kim. Malpass, 63, has secured approval from the World Bank's board after a campaign without competition. The World Bank Group announced in a statement Friday that he was selected as its president for a five-year term beginning on April 9, 2019. "There is a clear mission for the bank: poverty alleviation and shared prosperity. These goals are urgent, and I think we need a clear focus on achieving outcomes," he said. Malpass also highlighted challenges such as climate change, women's role in economic growth, and the need for stronger growth. "The bank has resources, it has staff, it has the ability to actually have an impact," he said. Candidates picked by the US , the World Bank's largest shareholder with 16 percent of its voting power, have all ended up assuming the leadership post since the institution's inception in 1944. Malpass, who once criticised the World Bank, has raised concerns within the international development community over his skepticism about the role of the bank and multilateralism. Inshallah: Alia Bhatt Plays an Actress While Salman Khan Plays a Businessman in the Sanjay Leela Bhansali Film? Virat Kohli Dons Pink Turban and Pathani Suit in Latest Instagram Post, Is it the Look for His New Commercial? Copyright © Latestly.com All Rights Reserved.